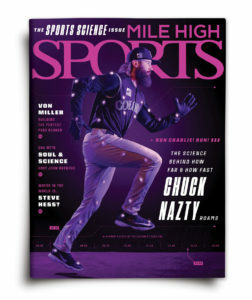 *This story appears in the May issue of Mile High Sports Magazine. Subscribe here! THURSDAY. MARCH 15, 2018. PEPSI CENTER. NUGGETS VS. PISTONS. As odd as it is to not see Hess on the Nuggets’ bench, it’s almost more bizarre to see him on the court at halftime. That’s when he usually works with players back in the locker room. Stretching them out. Assessing their immediate physical condition. Determining the exact thing their bodies might need at that exact moment – all in the spirit of winning a basketball game, so long as the body is willing and able. And if by chance it’s not up for the task, Hess is the first one to ask: Why? But there he is. Standing at center court. Not working with a player. Not stretching anyone out. In fact, it’s dark. There’s a spotlight. And Steve Hess is standing under it. To say that Hess has played a major role with the Nuggets would be an understatement. He was there before and after Carmelo. He saw the worst, the best and everything in between. He helped Kenyon Martin overcome not one, but two, microfracture knee surgeries. Never – not once – did a Denver Nugget suffer an ACL injury and then re-injure that same knee. He was a part (a big part, as any Nugget will profess) of the team that made it all the way to the 2009 Western Conference Finals. These are the things that Steve Hess is proud of. These are the reasons the Nuggets hold him in such high regard. Yet, he’s no longer with the team. That’s a new development, by the way. This is the first season he’s not. As much as he loves the Nuggets, Steve Hess is at peace with not being one. “When you say, “Absolutely nothing,’ it’s beyond their concept. “No, really, tell me what went wrong?’ they’ll say. Absolutely nothing. I mean this is a choice I’ve made. People can’t really understand that. That’s the thing that amazes me. This is one of those go from an unbelievable situation to another unbelievable situation. They were the doctors who own and operate Panorama Orthopedics and Spine Center. They were the ones who could take a formal arrangement, one that showed Hess as a consultant and part owner (along with former Nugget Chauncey Billups and former Broncos Brandon Stokley and Chris Kuper) of “The Panorama Wellness and Sports Institute” – essentially the “training” division of Panorama – and turn it into so much more. They could take the vision Hess revealed to his wife, the one that caused her to rethink her husband’s sanity, and turn it into reality. Even so, Hess still had the ultimate job. He was one of – if not the – most highly regarded strength and conditioning coaches in the NBA. And he had seniority, 21 years of it. He was the guy that Denver Broncos would secretly go visit when something didn’t quite feel right. He was the strength coach players flew in from all over the NBA, NFL and MLB to see during the offseason. It didn’t matter what team Hess worked for, he could help cure their ills, give them the best training advice, and keep them from getting injured. His vision had stemmed from his experiences with the Nuggets. An organization like the Nuggets, he observed, took great care of its players. There was never a shortage of effort or resources to make sure every player on the roster was functioning at the highest level. When someone was injured, only the best surgeons were used. When it was time to recover, they’d let Hess go to work. He could tap into any expert, obtain any piece of equipment, use any method he thought would get the job done. The team provided the tools and Hess masterfully kept its players in tip-top shape. It was a strength and conditioning coach’s dream. Never was there a player who came through Denver that didn’t love him; they’d work hard for Steve Hess. His vision, perhaps not so ironically, was to create that same exact opportunity for anyone – not just NBA players. Young or old. Active or idle. Elite or recreational. Hurt or healthy. It didn’t matter. When someone gets hurt, they need to get better, maybe even better and stron- ger than they were before. When someone who isn’t hurt wants to be a better form of themselves, they should be able to do that, too. Oh, and it would be nice if the entire process all took place under one roof, under the guidance of one team, whose expert members all had one – and only one – goal in mind: Do whatever is best for that particular individual. When Hess, who at the time was still with the Nuggets and just a part owner of and consultant for The Institute, proposed this idea to Eric Worthan, the Panorama Orthopedics and Spine Center CEO, Worthan texted back with one word. Hess sat at the table inside Capitol Grille on Larimer Street. He was flanked by Worthan, Dr. Pat McNair, Dr. Doug Foulk, Dr. Mitch Seemann and Dr. Mark Conklin. This was the brass – the “big red engine” as Hess called it – that powered Panorama. “I am absolutely, unequivocally the dumbest guy in the room,” he thought. Yet, they were listening to every word he had to say. Worthan had shared Hess’ vision with the group and it had piqued their interest. They would pepper him for the next two – maybe three – hours. He answered every question. They considered his words, and challenged him more. They had ideas, too. They bounced them off him. It was the greatest meeting he’d ever had. “Would this type of thing interest you at all?” they asked. But he also thought of that job he’d had for 21 years. So he took the leap of faith, thanked the Nuggets for everything, cleaned out his office at Pepsi Center and set up shop just south of C-470 and Lucent. This newly scripted vision, complete with buy-in from everyone involved, couldn’t happen overnight. The plans they’d etched would take time if they were to be done right. This was to be an integrative system, an integrative facility, an integrative effort from top to bottom, start to finish. The doctors said they didn’t care about hype or fluff. They wanted meat and pota- toes results. Everything was to be based in science and data with results that could be delivered again and again. They asked the energetic Hess, who can talk and think a mile a minute, to implement just one thing at a time. “It wasn’t like, “Here are the keys to the Ferrari, good luck,'” says Hess, whose business card now reads CPO, or Chief Performance Officer. At the root, everything was still about the individual. And that’s where every plan at The Institute begins. The system Hess implemented provides a pathway to the necessary, objective data. Whether someone is going into surgery, coming out of a surgery performed by one of Panorama’s world-class surgeons, or simply coming in healthy and trying to improve their vertical leap, lose weight or become better at the game of their choice, they all start with this collection of data, which ultimately yields the performance profile. It begins in the DARI Lab. Picture a room, roughly 12 feet by 12 feet, with multiple cameras set up on all sides. There’s a bright green floor and a monitor on one wall. The individual steps into the center of the room. After a series of motions are performed, the DARI system has an unbelievable understanding of the body standing on the green floor. On the monitor, the individual being tested can see the alignment of their spine and joints, but more impressive yet is the data DARI spits out. In layman’s terms, DARI tells Hess’ group how that particular body is working. Are things aligned? Are there deficiencies in muscles or joints? Does the athlete favor one side or the other. Is there symmetry or asymmetry? Does their range of motion have room to improve? And why? Next, each individual is examined through MuscleSound, an ultrasound technology that determines muscle health. What is the size and asymmetry of the muscles? How much fuel can each muscle hold? How efficiently is that fuel being utilized? What is the exact body composition? The body fat percentage? Then the questions are asked: What do you want to become? What are your personal performance goals? Answers can range from the basic – “I want to move without pain” – to the aggressive. Return to an elite level. Be stronger after surgery than before it. Do or be something never done before. Imagine an individual who’s injured. They’ll first consult a surgeon. They might work with Hess and his trainers for “pre-hab.” Then they undergo surgery by one of the best in the business. After that, they’ll work with the experienced physical therapy team. From there, they’ll begin getting stronger thanks to Hess and his trainers. They might mix in Muscle Activation Therapy or chiropractic along the way. They spend time in the state-of-the-art weight room, on the 40-yard turf field or on the hardwood of the Chauncey Billups Big Shot Basketball Academy. Or have consultations with the on-site nutritionist. The Panorama team tests progress – objectively, scientifically. Every person involved in the process communicates at every step. Recovery and performance plans are designed, implemented, evaluated and tweaked. From training to treatment to nutrition, the process is ever-evolving, based on the needs of the individual and the wisdom of crowd – or in this case, “the entire team,” as Hess calls it. “I’ve heard it a thousand times,” says Hess. “I’ve been in situations where everyone says they’re working together, but they’re trying to hold on to what it is they know. To observe Hess is to witness living, breathing, shouting, whirling, smiling excitement. Mile High Sports Magazine once dubbed him “The Energizer Bunny”. It’s true; he keeps going and going and going. His enthusiasm is unparalleled; that’s not an opinion, it’s a fact. rah-rah speeches and weight-room challenges. It’s all based in science. “Everything we do has to be based in science,” he says, “and it has to be smart, and we have understand the why of every single thing we do. He is a scientist. A trainer. An artist. A motivational force. And he has surrounded himself with a group that checks all those same boxes. “Don’t get us wrong – we’re fully aware that 90 percent of what we do is training,” says Hess. “Ten percent is the information we get, but if we can’t have a plan to utilize it, we’re screwed. I can be the greatest data collector on the planet, but if I don’t have a plan of action, my 90 percent won’t work. Hess has story after story of successful journeys where the broken become fixed. As he rattles them off, his days in the NBA seem like a distant memory. Yes, he cherishes that time and those relationships, but the promise that lies with the days ahead is what gets him out of bed every morning. He lights up when talking about a recent client, a man who had his cervical vertebrae fused, his lumbar vertebrae fused and was 40 pounds overweight coming out of it all. After time with Hess, he’s better than ever. He hopes the 14-year-old who just tore his ACL will have an experience that’s not unlike one that LeBron James would go through if he were to suffer the same injury. “We want to do that. One-hundred percent,” he says. For those who wonder where Hess is these days, or more specifically, why he’s no longer on the Nuggets’ bench, the answer can easily be found in The Institute’s new corporate performance program, a training opportunity that has nothing to do with surgeries, physical therapy or elite-level athletics.